Changing a scene's status and making manual approvals is a way to track its progress in your production. For example, in a scene whose drawings are being scanned, you can set the scene status to Scan. After you begin adding colour to these line drawings, you can change the scene status to Paint. To change a scene's status, the approval policy must be set to Manual. You can also create customized approval stages that reflect the approval process in your production environment—see Managing Jobs. 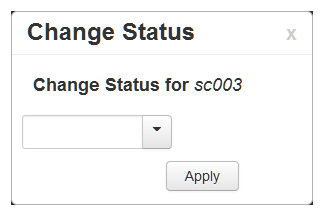 ‣ Select Scene > Change Status. ‣ Right-click and select Change Status.